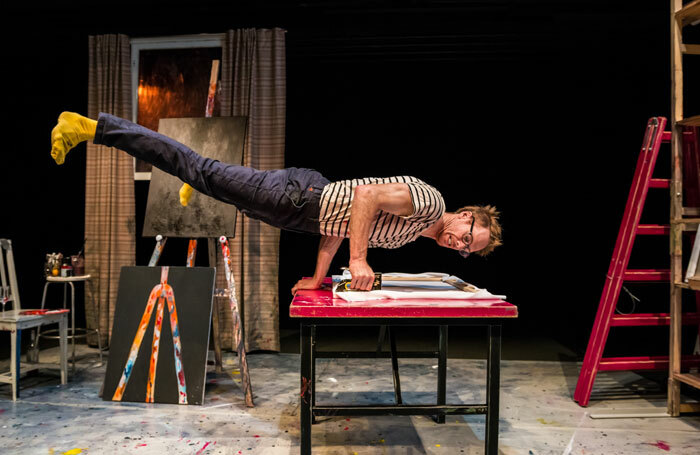 Circus performer and clown Thom Monckton makes an art form out of dawdling around in this deft and almost perfectly paced solo show. A gangly, delicate-looking type with tufted hair and glasses, he’s the eponymous painter, struggling for inspiration behind the canvas in his bespattered garret. A master of the moue, Monckton careers from one exquisitely controlled mishap to another, variously involving ladders, buckets and a staple gun. The costive strain that spreads over his face when he attempts to use the latter is a wonderful sight to behold. He also does a fine line in demented grins and compulsive twitching. Somehow, he can simultaneously flip his glasses on to his face and catch a paintbrush in his mouth. Aided by some atmospheric lighting, absorbing flights of fancy emerge from the fiddling and procrastination – a fruit bowl set out for a still life painting becomes a hot bath for a denuded banana as well as a nightclub that’s gatecrashed by a pear. The sense of invention and play is captivating for all ages. With his loose-limbed moonwalks, bouts of acrobatics, sock dramas and fruit-inspired gibberish, Monckton is a delight. It’s a show that’s never indulgent, the momentum never sagging in the build-up to a lovely denouement.